In the aftermath of the Hanoi Summit, President Trump has been barraged with attempts to undermine his confidence in the good faith of Kim Jong Un and his intentions to deal fairly with the United States in the negotiation process concerning denuclearization and de-escalation of tensions on the Korean Peninsula. One of the primary causes of concern has been a series of reports from NBC News claiming that “commercial” satellite footage shows that the Democratic People’s Republic of Korea (DPRK) has been engaging in fresh construction at their Sohae Launch Facility in preparation for an alleged missile launch or test. Not only is the use of the term “commercial” misleading in nature, but analysis of the photos indicates that the activity at the Sohae facility is related to deconstruction. The reports are driven by a number of entities with connections to the Central Intelligence Agency and a number of other special interests which call into credibility both the veracity of the reports and the journalistic integrity of NBC News. The NBC report, written by Courtney Kube, Carol E. Lee and Andrea Mitchell, concerns satellite imagery released by the Center for Strategic and International Studies (CSIS) purported to have been taken on March 2, 2019. The imagery suffers from two defects – the fact that the images show two different facilities being attributed as one by the media, and that the purported construction activity indicates dismantling of the Sohae site rather than fresh additions or repairs. Side by side comparisons of the photos show that they are in fact taken from two different locations. This discrepancy might be apparent to an analyst with knowledge of North Korea’s Sohae Launch Facility, but not to an average member of the public. The positioning of the two cranes in the photo is not advantageous for construction of a tower since they cannot efficiently raise material to it from the ground level. The cranes are so close together that their arms are at risk of colliding during construction. The image shows that materials are in fact being moved from the towers into a paved area in the center of the facility where they can be more easily removed by vehicles. Tire skid marks on the pavement in the facility appear to show that vehicles were loaded with heavy materials before leaving rather than entering with large amounts of freightage on board. Buildings at the facility are in a state of partial dismantlement or have otherwise been untouched. If the facility was being rebuilt, all surrounding buildings would be refurbished before work began on the tower. The crane closest to the tower has been outfitted with a shorter arm. This is a strong indication that it is bringing tower segments down to the ground level rather than raising them. The second crane is outfitted with a longer arm to take pieces disassembled by the first crane and lower them to the ground level in the center of the facility where they would be stacked for removal. The photo even appears to show a flatbed trailer near the central paved area which may have been used for the purpose of removing disassembled materials. The activity in the photos has been totally misrepresented with the intent to cause viewers to interpret the activity as construction. This analysis is consistent with a report from the Washington Post in July 2018 labeling similar behavior at Sohae Satellite Launching Station as dismantling of a rail-mounted processing building. Additional footage released by CSIS which was purported to have been taken on March 6, 2019 shows imagery where the photographed facility displays apparent distress or overgrowth on the pavement in the center, while solar glare obstructs an optimally clear view of the buildings that are claimed to be under “construction.” Structures that appear in the supposed March 2, 2019 photos are also mysteriously missing less than one week later. Considering the analysis mentioned above, these defects do not create confidence in the veracity of the claims being presented to President Trump and the public. An investigation into the sources of the imagery and accompanying analysis creates serious doubts about the incentives with which they are being presented to the public and the groups involved in the Korean peace negotiations. NBC News based their report on the Sohae activity on analysis from Beyond Parallel, a project run by CSIS. An examination of Beyond Parallel‘s About page shows ties to the Heritage Foundation, the Atlantic Council-connected Korea Foundation and the Brzezinski Institute on Geostrategy. All of these groups have advocated for hawkish US policies towards North Korea that will not be conducive to productive negotiations. CSIS itself is currently run by John Hamre, former Deputy Secretary of Defense under President Bill Clinton and former Rockefeller fellow. CSIS’ corporate officers include members of the Brzezinski Institute on Geostrategy, a Henry A. Kissinger Chair and other individuals with work histories related to foreign policy and the American defense industry. It would be remiss to say that such connections do not indicate a strong bias against President Trump’s attempts to seek denuclearization and peaceful dialogue with North Korea. The images themselves were represented by NBC News as being “commercial” in nature. An examination of the companies from which they are sourced shows that they are in fact deeply tied to groups that do consistent business with the CIA and defense industry. The March 2, 2019 photos are sourced from DigitalGlobe. DigitalGlobe is an American vendor of satellite imagery founded by a scientist who worked on the US military’s Star Wars ICBM defense program under President Ronald Reagan. DigitalGlobe began its existence in Oakland, CA and was seeded with money from Silicon Valley sources and corporations in North America, Europe and Japan. Headquartered in Westminster CO, DigitalGlobe works extensively with defense and intelligence programs. In 2016, it was revealedthat DigitalGlobe was working with CIA chipmaker NVIDIA and Amazon Web Services to create an AI-run satellite surveillance network known as Spacenet. In June 2018, Disobedient Media reported that the CIA was using Ken Dilanian, a known media asset of the Agency, to push reports with NBC News claiming that the DPRK was increasing nuclear production at “secret sites” without providing any actual evidence for such claims. The report carried satellite images claiming to show improvements to North Korea’s Yongbyon Nuclear Scientific Research Center which were obtained from Airbus Defense and Space SAS, a subsidiary of European multinational conglomerate Airbus Group SE. Airbus was the brainchild of Germany’s DaimlerChrysler Aerospace and British Aerospace. The association of a German connected transnational group in efforts to undermine Korean peace negotiations is interesting given the strong connections they held with the now scandalized South Korean government of Park Geun-hye. 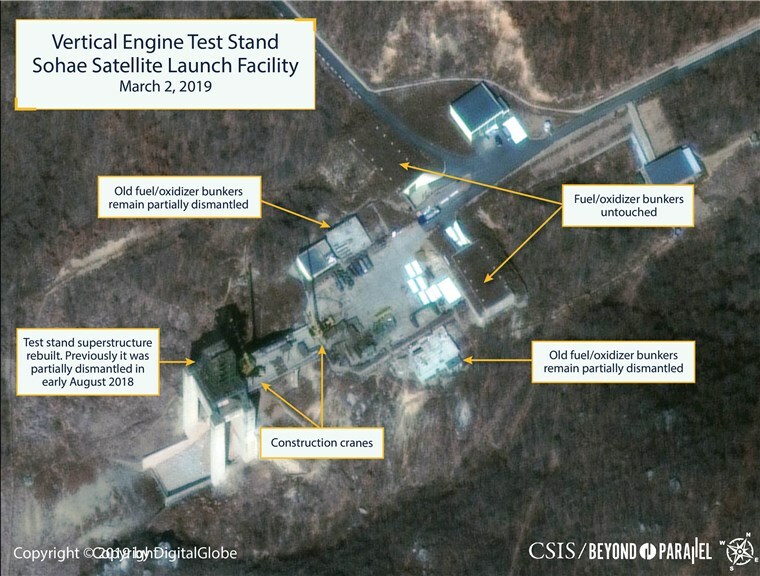 Airbus also provided imagery of the Sohae Launch Facility circulated by CSIS on March 8, 2019. NBC News’ report also cited analysis from 38north.org. 38 North is a project run by the Henry L. Stimson Center. The Stimson Center’s Board of Directors includes individuals associated with organizations such as Northrop Grumman, the Boeing Company, Warburg Pincus, the Carnegie Endowment, Mercy Corps, The Council on Foreign Relations, the Department of Defense, the CIA and US Department of the Treasury. Their Partners include the George C. Marshall Foundation, Saudi Arabia’s Gulf Research Center and the Jinnah Institute. The decision by NBC News to include a plethora of biased sources of analysis which appear to have intentionally been misrepresenting the nature of satellite footage of the DPRK’s Sohae Satellite Launching Station seriously calls their journalistic integrity into question. Their decision to represent satellite footage obtained from intelligence contractors and defense industry sources as “commercial” totally removes any remaining doubts that the recent reports of alleged North Korean activity after the breakdown of the Hanoi Summit are solely distributed with the intention of propagandizing not only the public but also President Trump himself. It is a pathetic effort to undermine the potential for peace and economic opportunity for the purpose of continued tensions that only benefit select special interests. As Disobedient Media has previously noted, the negotiations have been largely successful in spite of a few recent missteps. Dialogue and constant communication between the DPRK and US negotiating teams must continue. If all parties can ignore the static created by bad faith actors attempting to scuttle the process there is a bright future ahead for not only the notorious hermit kingdom but its neighbors who have long lived in apprehension of a day where renewed violence might break out on the Korean Peninsula.